Los Angeles is having a fierce heat wave and it’s hot, hot, hot here. Last night, at 8pm, it was 98 degrees. 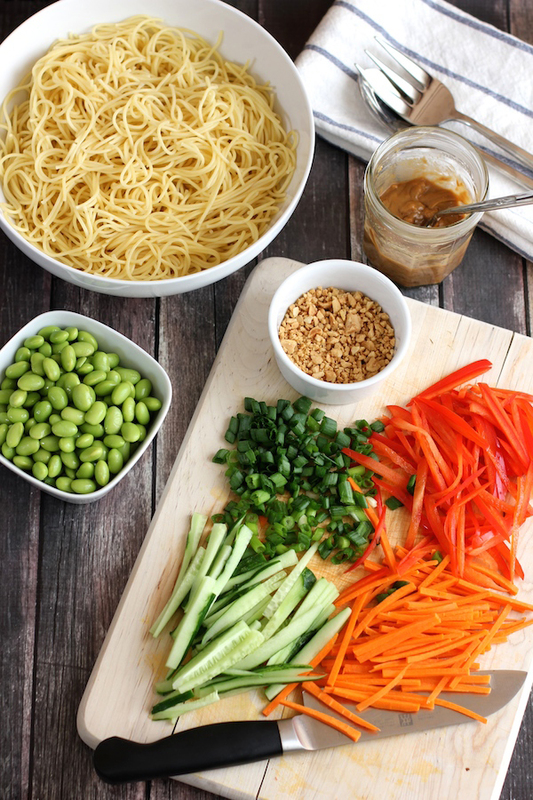 So I’m making something cool and peanuty and crunchy for lunch – a cold noodle salad with peanut sauce and vegetables. 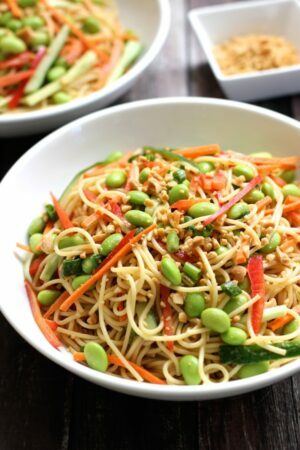 This is a colorful, refreshing salad featuring cold noodles, a light peanut sauce and lots of fresh, crunchy vegetables. The peanut dressing is a light sauce with a hint of sesame oil, rice wine vinegar and soy sauce. It’s not a heavy, thick sauce – it lightly coats the noodles. 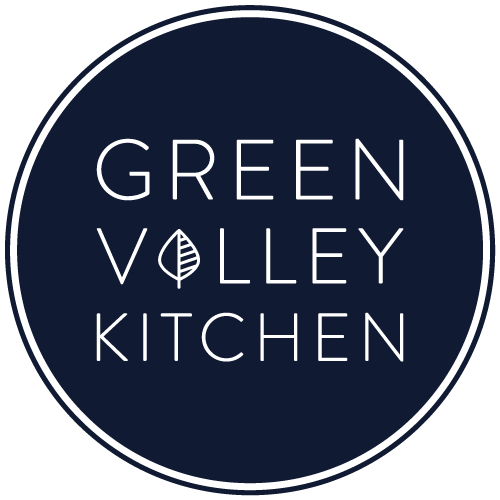 The vegetables are crunchy and cool – bright green edamame, pale green cucumbers, red peppers, orange carrots and green scallions – they’re a colorful bunch. I carefully sliced the cucumber, red peppers and carrot as thin and evenly as I could – I was going for matchstick thin slices – and tried to keep them roughly the same size and length. A sprinkle of chopped peanuts at the end adds some additional crunch and a little more peanut flavor to the salad. After cooking the noodles, you’re going drain them in a colander and then rinse them under cold water to cool them off. If for some reason you leave them for a bit and they stick together – no worries – just rinse them again under a little cold water and they will all magically unstick. You want to toss the cold noodles first with the peanut sauce. Add a little bit of sauce at a time as you toss so all the noodles are evenly coated. Once all the noodles are covered in the peanut sauce, add the vegetables and give it a final toss. Make sure to use a large bowl so you have lots of room for all the ingredients. You can use smooth or chunky peanut butter for the dressing. I used a natural chunky peanut butter. I left the white part of the scallion out since I feel it’s too strong and I wanted the peanut flavor to shine through. So only use the green part of the scallions. When you pulse the peanuts (to add as a topping) in the food processor – be careful not to process too long – otherwise you’ll end up with peanut butter. This cold noodle salad with peanut sauce and vegetables is great the next day. If you’re refrigerating it for any length of time – keep the chopped peanut topping separate – they don’t refrigerate well with the sauce – they lose their crunch. A cool, refreshing salad with cold noodles, a light peanut sauce and crunchy vegetables. 8 oz of thin pasta – I used thin spaghetti – cooked as per box instructions. Cook pasta according to package instructions. Drain in a colander and rinse under cold water and set aside. Slice the cucumber, carrot and red pepper into thin matchstick shapes all roughly the same size – set aside. Slice scallions thinly and set aside. Measure out edamame and set aside. Add peanut butter, dark sesame oil, soy sauce, rice wine vinegar, honey, red pepper flakes and water to a small jar. Shake vigorously until combined. Pulse 1/4 cup of peanuts in a food processor until they are finely chopped. In a large bowl, add cold pasta. Toss with peanut sauce – a bit at a time – until all combined. Add all veggies to the pasta with peanut sauce and toss to combine. For each serving, sprinkle a little bit of chopped peanuts on top. Oh my!! I m totally loving this noodles.. they look so colourful and delicious!! definitely trying this!! Love it! Yum! It’s so hot in Sacramento too! I am ready for Fall! These cold noodles sound perfect! Yum! 98 degrees doesn’t sound very comfortable! Great idea to make a refreshing noodle dish to fit the weather. It’s already cold here in Chicago, but I think I need to try this anyways! I love peanut sauces and like how yours isn’t overly thick. All of the vegetables bring such a nice color to the dish, and I’m sure the crunch from them is great too. Thanks for sharing, Geraldine! Thank goodness it’s a bit cooler cause the last couple of days have been crazy! Have a cool one, Greg. Hi Crystal – I am also looking forward to cool weather – can’t wait to wear a sweater :). Have a great night! Oh dear, Geraldine! 98F!? No good! But, this delicious recipe is a result of that heat wave so I guess it’s not all bad! The flavors in this salad are mouthwatering. I especially am drawn to the sauce, but the perfectly cut veggies are stunning! They’re so pretty! Thank you for another delicious recipe! Thanks, Traci! I thought slicing the veggies was going to be a lot more time consuming than it was – it went pretty quickly once I got my rhythm down. Have a good one! I absolutely adore cold noodle salads, and your version looks amazing! I hope your heat wave ends soon, that is WAY too hot! Hi Denise – still toasty here today – supposed to be over 100 this afternoon. Saw on your site that you had snow! Isn’t mother nature crazy. Have a great day!